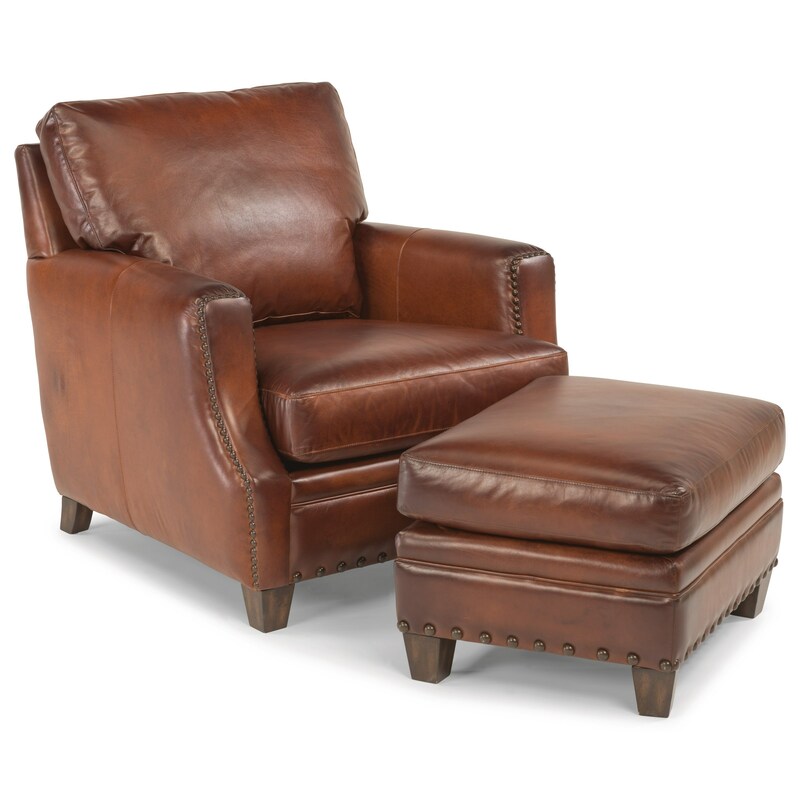 Offering an updated rustic look, this leather chair and ottoman set will make a great addition to your home. Rustic elements such as large nailhead trim and rich handcrafted leather are complemented by a hint of modern style in the slender track arms and tapered feet for a unique blend of styles that will match with all kinds of decor. As comfortable as it is stylish, the chair in this set also features a luxury seat cushion and loose-pillow back cushion that will remain resilient for years of use. The Latitudes - Maxfield Rustic Leather Chair and Ottoman Set by Flexsteel at Ruby Gordon Home in the Rochester, Henrietta, Greece, Monroe County, New York area. Product availability may vary. Contact us for the most current availability on this product. 1505-10 Chair 1 36" 40" 38"
1505-08 Rustic Leather Ottoman with Nailhead Trim 1 27" 22" 18"
Padding & Ergonomics The Luxury Cushion with 1.8lb density polyurethane foam core topped with 1.2lb density polyurethane recovery foam and 1oz fiber wrap comes standard. Create an atmosphere that will make your friends and family feel welcome when you bring this toned-down rustic living room collection into your home. The large nailhead trim and rich handcrafted leather with unique variances create a rustic feel while the slender arms and tapered feet provide a touch of modern style that will help this collection blend with any decor, new or old. Equipped with Flexsteel's time-tested DualFlex Spring System, you can be confident that this living room furniture will last for years to come. The Latitudes - Maxfield collection is a great option if you are looking for Rustic furniture in the Rochester, Henrietta, Greece, Monroe County, New York area. Browse other items in the Latitudes - Maxfield collection from Ruby Gordon Home in the Rochester, Henrietta, Greece, Monroe County, New York area.